I finished this little kit, which had been waiting patiently for about fifteen years. If I want to continue with fine embroidery, I’ve decided I need a magnifying glass! I finished the vintage Hokusai bunka kit today. The ocean horizon line is crooked because it was still tacked in the frame when I took the picture. 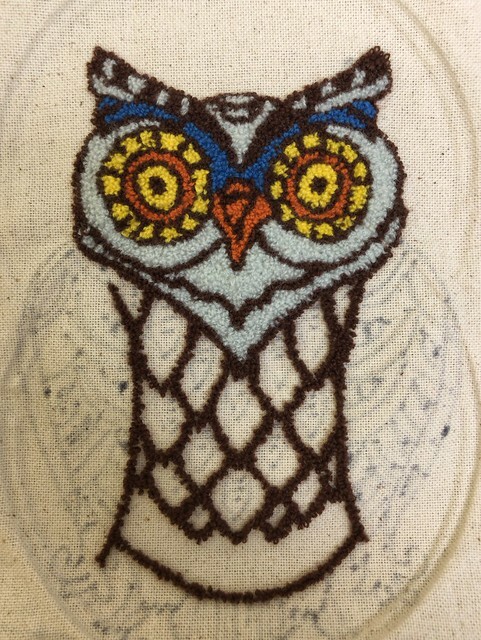 This type of embroidery may be a little dated, but I liked it so much I’ve been bidding on bunka yarn to try an original design. It’s probably more than halfway done but I know the details will take a long time, so it will be awhile before my vintage bunka kit is finished. I’ve surprised myself by being patient with this. Bunka is a style of embroidery from Japan using a tightly-woven polyester backing and a four-ply rayon yarn (chainette). 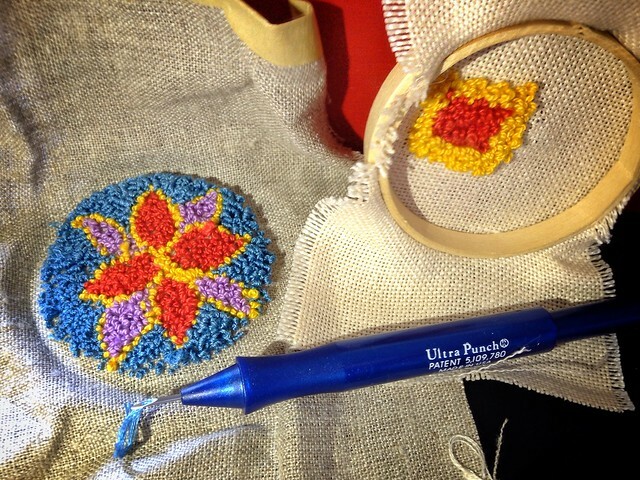 The yarn is unraveled before punching it into the canvas with a punch needle. 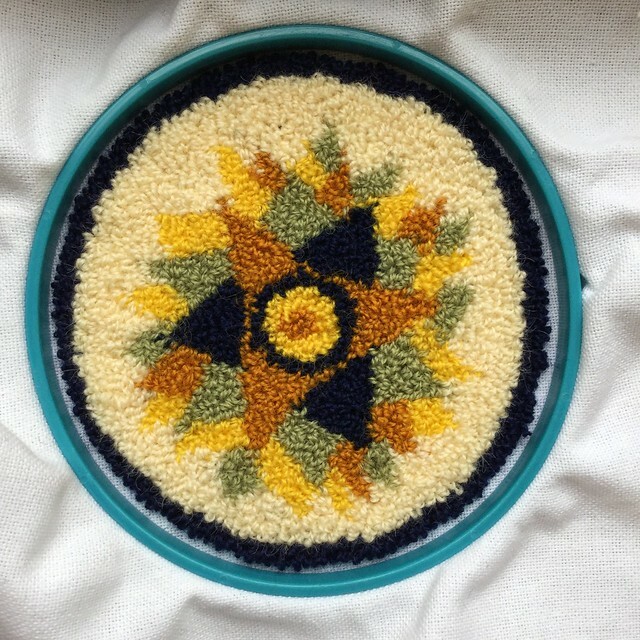 Unlike other punch needle projects I’ve done, the goal isn’t to cluster many loops in a small space; rather, the threads can be extended up to about a half-inch. They lay flatter against the surface, although there’s definitely a dimensional result that’s fascinating to look at. The kinks left in the yarn after unraveling keep the loops secure on the backside of the fabric. Because bunka is stitched face forward after tacking it on a frame, it feels much more like painting on a canvas. 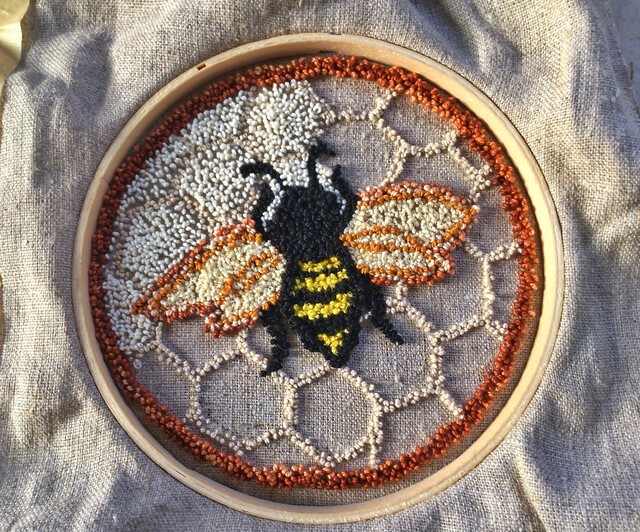 However, the final product is not sturdy like a punch needle or hooked rug or even stitched embroidery. In fact, I think a bunka painting is meant to be just that–a painting. I bought a vintage bunka kit off Etsy. It came with a design on the backing–a lovely woodcut by Hokusai–the bunka yarn, and a small printout, one side with a color painting and the other with a lined drawing of the project with numbers written in that correspond to the yarn colors. It’s exactly like a paint-by-number kit. With instructions in Japanese and only a handful of instructional videos available on Youtube, however, I’m fumbling my way through this, but I’m enjoying it tremendously. The wavy rayon thread and synthetic backing give the piece a unique shimmery, dimensional feeling. I love the look of bunka. Bunka gained popularity in the 1960s but it may have seen its heyday, although there are a few companies out there as well as an organization or two devoted to it. I’m on the hunt to find supplies in order to try a few designs of my own. And tucked inside, two eBay finds: a Rumpelstiltskin manual Speed Needle and Gloria Crouse’s Hooking Rugs. At least, I think it’ll be a pot holder. This is wool on a cotton background. 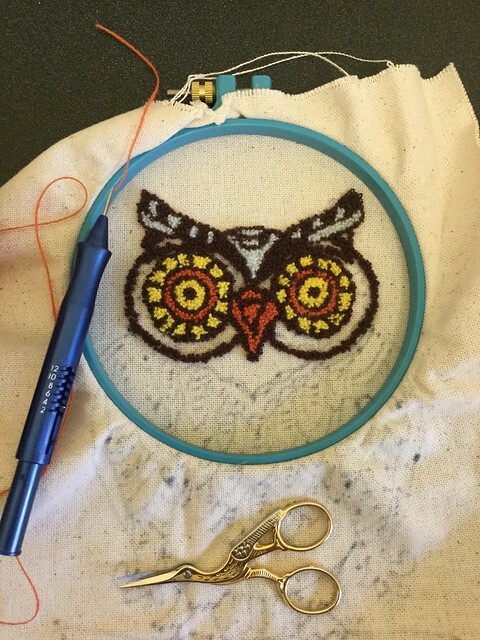 This was another super-fast embroidery project using the needlepunch. I can say that buying a new hoop, a plastic one with an inside lip around it, has made all the difference. The cloth stays in place, and as a result, I cruised with this little knight. The border is a Greek meander pattern. 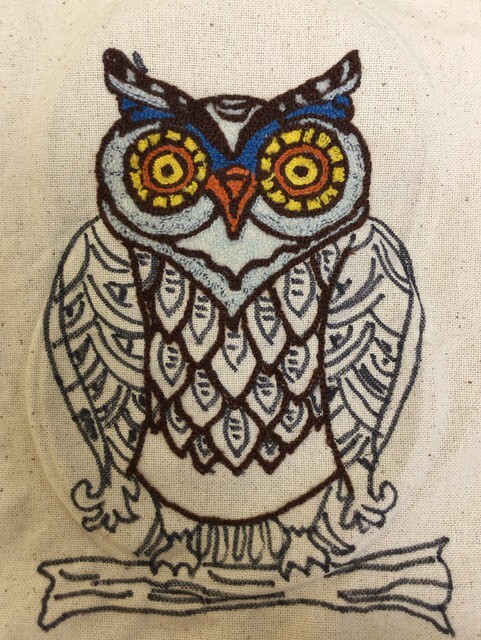 I found ideas online and in books and then drew them on the back of the cloth. I need to investigate different ways of finishing these up. Finished except for the finishing. It’s not weaving… what can I say? It’s summer, and I’ve been in a weaving lull, and I needed a change. 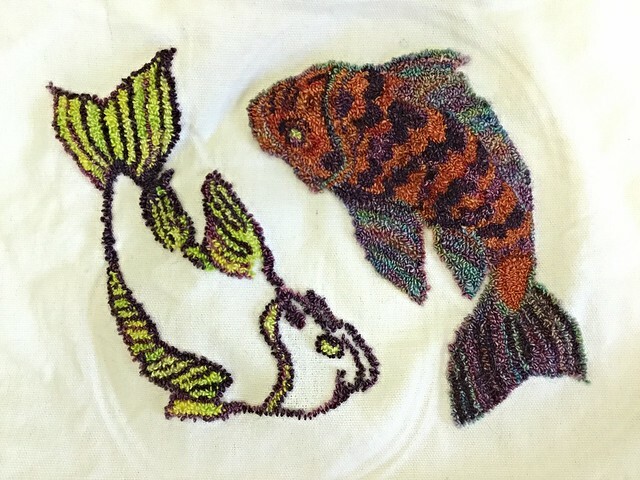 I’ve become smitten with a form of embroidery called needlepunch. It’s like a miniature hooked rug. Maybe this is a trend? Or was? I may have missed it, but I know it’s been around for quite awhile and there are numerous tutorials on Youtube, so that probably means it’s a trend. It’s new to me, however, so I’m finding it one of those things that gets my imagination going. 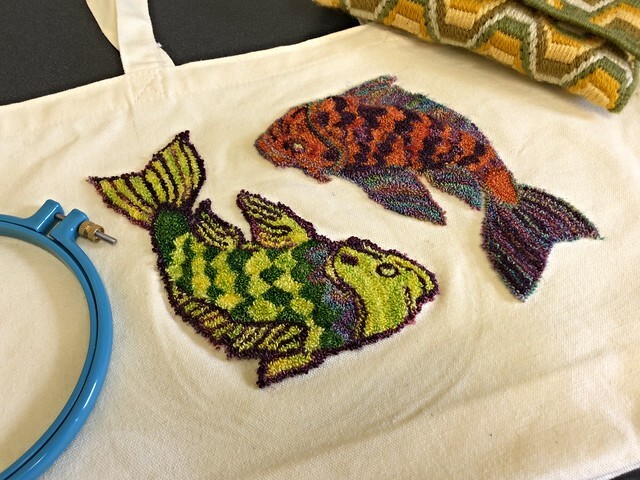 The process is simple and almost feels like coloring–with a razor-sharp needle. Mine’s the Ultrapunch. It’s threaded with embroidery floss or crochet thread, and then you punch through the wrong side of piece of fabric held in a hoop or frame, leaving a flat stitch on the back and a loop on the front. These loops can be pulled out easily from the back, but they’re very secure from the front. The size of the needle and depth of the loop can be changed on my needle, so I can do a very minimal loop or a pretty substantial one. 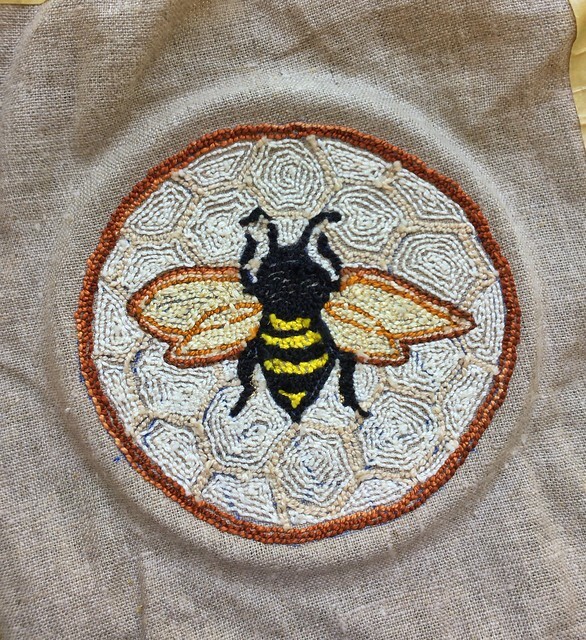 The taller loops cover more fabric surface, so the shorter loops, like in the honeycomb in my bee design, are allowing more background fabric to peek through. I don’t mind because I like the look, but I can imagine with some designs it would be annoying. Eventually, after enough loops and stitches are clustered near each other, a section is built up and your design appears. Each time you want a color change, you re-thread your needle. The final feel is a cross between terrycloth and a rya rug. Most pieces run on the small side, less than 12″ square. 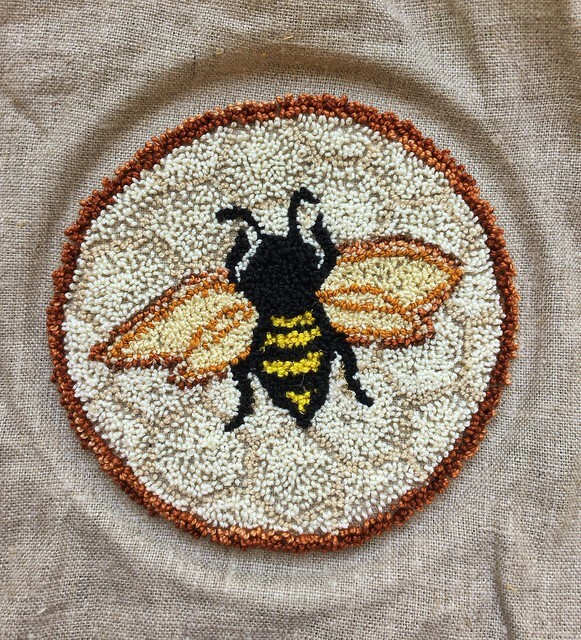 My little bee design measures just 5″ across. 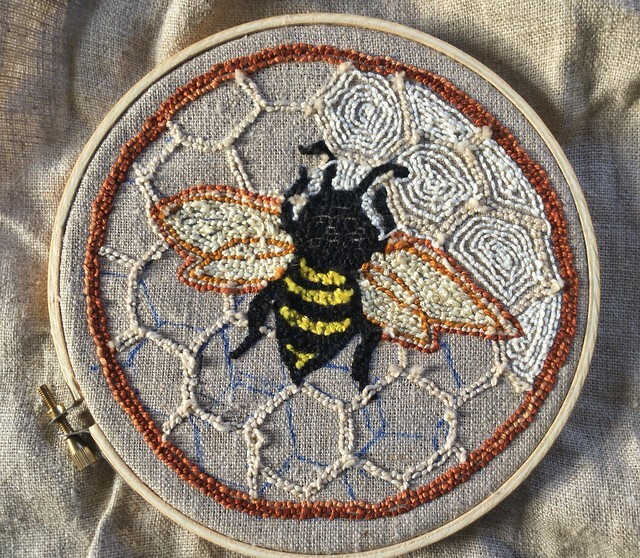 This is a decorative craft, although I suppose you could find ways to make patches or bags out of the finished pieces to turn them into useful items. Tension of your working fabric is important, and it’s something I’ve been struggling with using the bamboo-type of embroidery hoops that I own. I have to stop and tighten the fabric every few minutes, so I purchased a few new hoops, and I hope they grip better. Some “punchers” buy frames that hold the fabric in place with sharp metal tines. They’re rather pricey, but I bet it would do the trick. I also purchased what’s called weavers cloth for the fabric, which is a tightly woven, 50% cotton, 50% polyester blend. I’m using a linen needlepoint fabric right now, and it stretches out very easily. 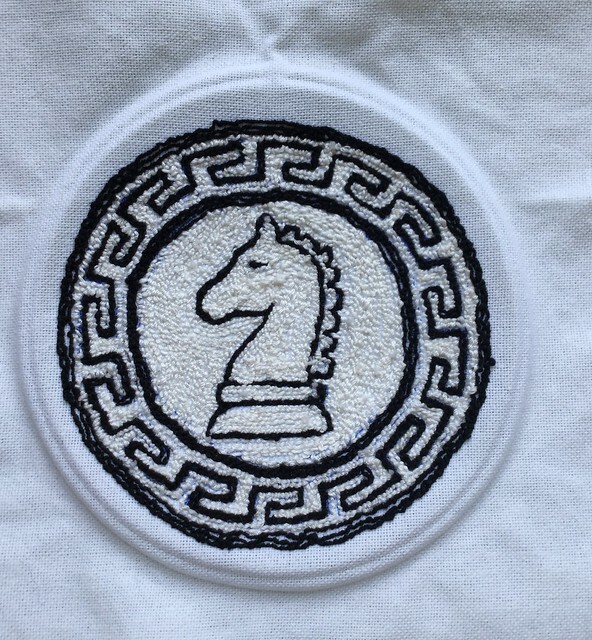 My first little design is coming along. 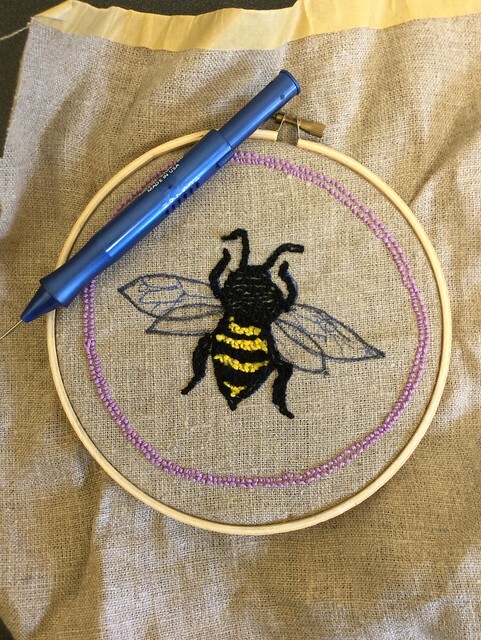 A wanted to embroider a bee, and the hive idea came second. If I would have thought it through, I may not be struggling right now with how the background is overwhelming my poor little bee. I plan on re-outlining the wings. Punching is fun! Except when you “punch” a hole in your finger. Twice in a row. And leave dots of blood on your fabric. 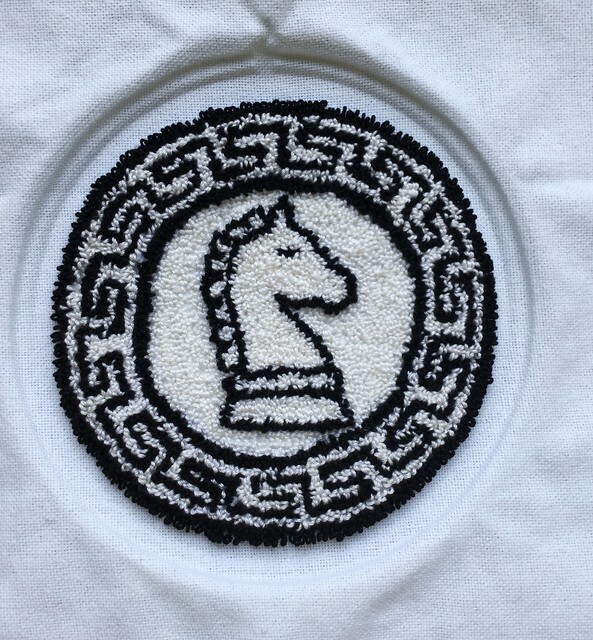 Punching is fast–compared to tapestry weaving, that is. Using a few different lengths of loops creates some interesting texture and dimension. Two rows placed close together create a strong outline. My attempts at using just one row made dots and not a solid line. My recent fascination rya rugs may be inspiration for mini needlepunch designs, so I’m excited to experiment with longer loops. Because this year’s WAL in the Ravelry tapestry group is about the color wheel, I organized my cotton embroidery threads as closely as I could. Some colors only have one or two shades, but I’m learning as I go so it doesn’t matter all that much.